Newton, NJ – August 16, 2018 – Thorlabs announced today that it has released next-generation versions of its 1300 nm MEMS-VCSEL Swept-Wavelength Laser Sources. With a record-breaking coherence length of over 100 mm and sweep rates of either 100 kHz or 200 kHz, the SL131090 and SL132120 are the only commercially available MEMS-VCSEL laser sources on the market. Based on a patented microelectromechanical system (MEMS) tunable vertical cavity surface emitting laser (VCSEL), these light sources include an active power control that maintains constant output power over the lifetime of the laser. All drive electronics and trigger signals needed to seamlessly integrate these sources into custom swept-source OCT systems are provided. An output digital “k-clock” signal generated by the integrated Mach-Zehnder interferometer (MZI) and drive electronics can be used as a data acquisition sampling clock, with no further resampling in k-space required. 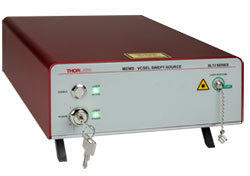 The k-clock signal delay and maximum output power of the laser can be user adjusted up to ±8 ns and ±5%, respectively.